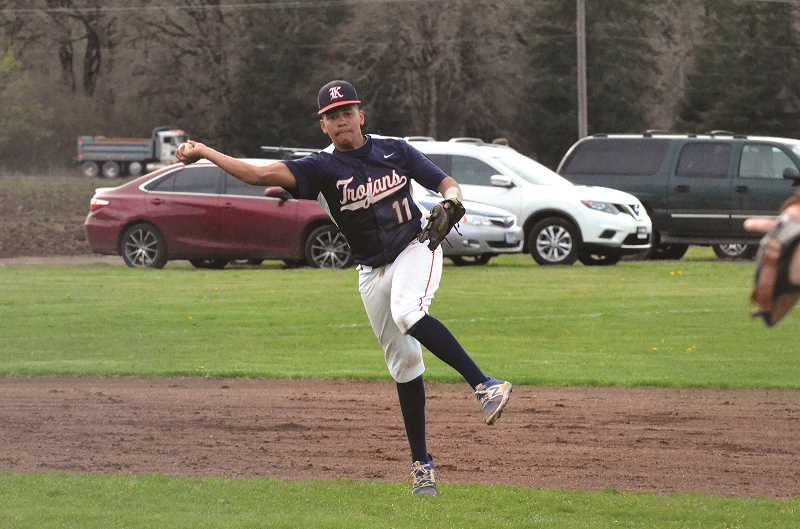 Considering Kennedy had outscored the Country Christian/North Clackamas Christian co-op team 22-0 in the first two meetings of the series, one could reasonably make the assumption that things were going to be one sided in the third meeting of the two teams. Though the No. 3 ranked Trojans got the W, the Cougars didn't make it easy as they defended their home field. After a back-and-forth game, Kennedy defeated it's league foe 13-6 on Wednesday, April 3 to improve to 3-0 in the Special District 2 (SD2). Country Christian/North Clackamas Christian falls to 0-3 in league play, and 3-6 overall. "Kennedy is a terrific baseball team, and they're coached very well," Cougars coach Garylee Syphard said. "(Kennedy coach) Kevin (Moffatt) does a great job. They're a top five program, and we know it. Our guys came with a different mental attitude tonight than they have in the last couple of games, and it showed. It showed in their plate appearances and the way they were ready." "Country came out to play for sure," Moffatt said. "Their swings were different this game than the first two games, they're well coached, and ready to go. Whatever (Syphard) said sparked them pretty good. I actually thought our guys played better today than the first two days. We didn't take advantage when we had scoring opportunities the first four innings." The Cougars came out strong in the fourth inning, picking up an RBI single courtesy of junior catcher Mark Grandle. Junior Tyler Burch was also able to make it across home plate thanks to an infield error on the part of the Trojans. Senior Sean Gilmer and junior Hadden Stark both got in on walks with the bases loaded. The Cougars now had six runs on the board. Kennedy answered, with the most emphatic runs coming from sophomore Brady Traeger. The powerful hitter knocked one ball out of the park to put two runs on the board for the Trojans, and also had a double that bounced over the outfield wall and helped propel his team towards the victory. "He's only a sophomore, and he's a pretty good baseball player," Moffatt said. "He got intentionally walked a lot this series, probably three times that were straight up intentional. I don't blame them because he's a great hitter, he got a home run and a double. You hope those first three guys can get on base in a regular basis because he's going to put a pretty good swing on one." After the game, both coaches admitted that while playing a three-game series back to back was definitely a change they had to adjust to from last season, it was still something they enjoyed and were excited for. "It's kind of the new schedule this year, and I'm excited to see how it goes," Moffatt said. "You see everybody's pitchers because you have to pitch six or seven guys a week. They're a young team, and this is a team that we probably should beat. But like I said, in baseball the most talented team doesn't always win it. We're not that good yet." "I think it's great," Syphard said, "playing three games in three days is a little draining on the pitching of course, but I love it from the stand point that you can see all of the pitching and you can't load up on one team and not on another. It's the way baseball was meant to be played. You also catch on to the rhythms of different players on the opposing teams, so the nuances by the time you get to the third game are that you pretty much know where they're going to hit the ball." Country Christian/North Clackamas Christian move on to face Santiam (5-2) in a three game series starting Tuesday, April 2. Kennedy squares off with Western Christian (3-3) on Monday, April 8.